Unburying history can have unintended consequences. With her daughter’s dangerous curiosity and her own work at a local history museum, Erica follows leads about the mysterious skeleton right back to her own neighborhood in its edgy, pregentrification days, the period when the age of Aquarius was turning dark. Now she finds that a cranky retired reporter wants to share old files, the charming widow of a slumlord has some surprises for her, and the crazy old lady who hangs around her street keeps trying to tell her something. Finally, there are some people - including ones she is close to - who know the whole story and will stop at nothing to make sure it stays buried forever. ©2013 Triss Stein (P)2013 Blackstone Audio, Inc. Early in this work of fiction Erica proclaimed that being from Brooklyn gave her "street smarts." If so then she somehow misplaced them for the duration of this book. Her bumbling excuse for an investigation and the numerous times that she somehow missed what was completely obvious to anyone possessing a cerebral cortex certainly belied it's existence. This seems to be a very unfortunate weakness of many works of the mystery/ thriller genre, so many ridiculously obvious clues are missed or ignored by the main character that they seem to be mentally disabled. It's also seemingly fashionable for all those fictional middle aged Nancy Drew's to feel certain that despite their limited experience they are more capable of solving crimes than those who do so professionally and that any risk of physical harm to them is impossible. Between these factors the believability of these selections tends to suffer quite badly. Still this is an okay listen and the mother daughter relationship is portrayed quite believably. I would definitely recommend this because it keeps you engrossed throughout the entire book. Erica of course. Being a single mother, going to grad school and working part time, I love her "go getter" and no nonsense attitude. What does Xe Sands bring to the story that you wouldn’t experience if you just read the book? Xe brings this book to life for me. The emotions of the characters comes through so beautifully when she narrates. She's extremely good at her craft. I did. Some parts were extremely sad while some made me chuckle. 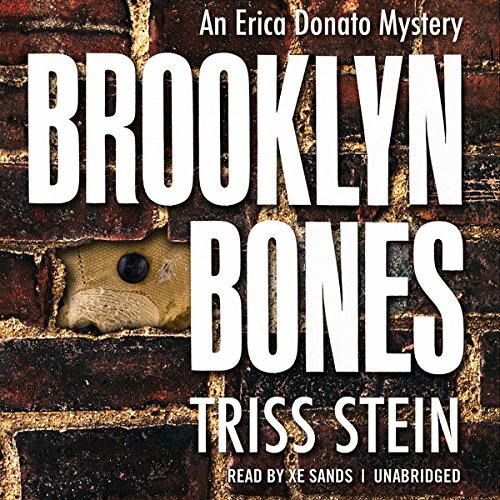 What did you love best about Brooklyn Bones? This was a good first book in what I think becomes a series. Enjoyed the development of characters. By end of story, most of the important of them were well drawn. This is a story of a young widow, raising a teenage daughter, in a house where a skeleton is discovered during some remodeling. She sets out to try to discover the mystery behind the original hiding of the bones, only to realize (along with the reader) that is becomes increasingly difficult to know whom to trust with information she is acquiring. What aspect of Xe Sands’s performance would you have changed? In the beginning, it was difficult to listen, or take the book very seriously, because her reading was uncomfortable to listen to. Sounded rather amateurish. Then somewhere not too far into the book, I realized that that quality had disappeared, and for the most part, the rest of her narration was okay. Generally, this was a good book and decent mystery. But there were some elements I would hope the author might change or improve in her next. The protagonist had a tendency to ignore obvious safety things that led to problems along the way. It seemed the plot development depended on these, when it would seem it might have been written with some less obvious mistakes on her part--and still have had more or less the same story. That would have made it more believable. I believe one of the strongest good aspects of the book was the author's right on target understanding of teenagers (and their relationship with parents). I plan to recommend this to friends, as it is pretty good with those few qualifications. I don't know what was more irritating, the story or the narrator. I tried to stick with the story, but I could not. In the end, I decided I didn't care how the story ended. I hate writing negative reviews, but I hate wasting my time and my credit more. The story just moved too slow and had too much filler. Great surprises! Great suspense! Great find! This book truly caught me by surprise. So many stories follow the same story over and over, but not this novel. A truly original plot except for the body in the wall. I never guessed who until you told me.